It's great because, frankly, Gimlets are great. Heck, see my post a couple ones before this, and you will know why I was interested in trying all of the different versions. That is one good cocktail, my friends. I will explain how to make ginger syrup later, but for now, let's get to the results. The Gimlet from Lance Orton on Vimeo. Everyone liked the first one the best, and I have to admit, I'm not surprised. The Rose's isn't a very strong lime flavor, so the cucumber shines. The smell of the cucumber goes perfectly with the drink, and it is the cucumber flavor that everyone loved about this one. The vodka didn't enhance the cucumber at all; gin is the way to go here. 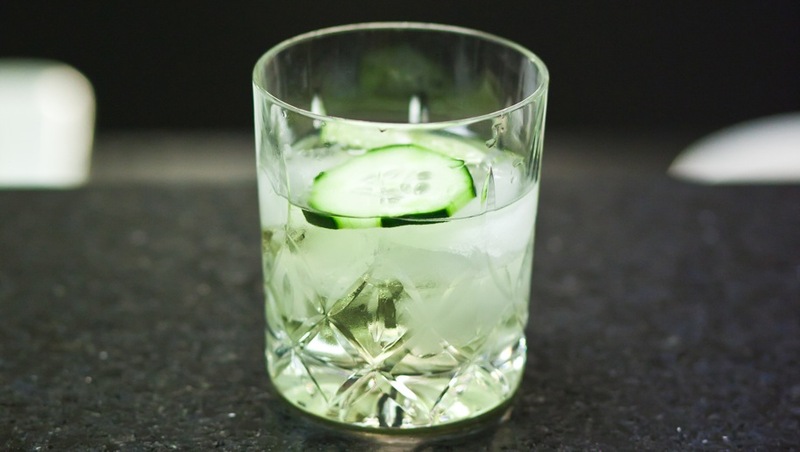 Gin is more flavorful, so it didn't seem as overpoweringly harsh as the vodka. The simple syrup option didn't work that well because it was too sweet, but everyone did like the addition of ginger. Again, it was too sweet, and it tasted like candy. Tasty, sure, but not like the gin with Rose's option. The verdict: stick with the original Gimlet: Gin + Rose's Lime juice with a cucumber and lime garnish. You can't go wrong.